Insurance claims can be daunting, especially after a disaster has taken so much from so many. Brasher Law Firm is committed to providing residents throughout Southeast Texas with the support to get through these trying times. 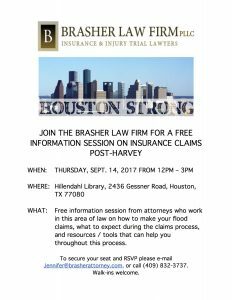 For the victims of Hurricane Harvey in the Houston area, Brasher Law Firm will host a seminar to provide information and resources to help them through the process of filing an insurance claim. The informational session will take place Thursday, Sept. 14, from 12 p.m. – 3 p.m. at the Hillendahl Neighborhood Library, 2436 Gessner Road, Houston, TX 77080. Our attorneys, who specialize in insurance litigation, will provide information on how to file flood claims, what to expect, as well as guides/tools that will help walk you through the process. The seminar is open to the public, but RSVPs are welcome. Call (409) 832-3737 or e-mail Jennifer@brasherattorney.com to secure a seat.